Zoranina the cloud Chomby walked to school. She had a sausage omelette and a green apple in her lunch box, which she carried around in her cloudy paw. She looked at herself in a little pink beauty case she had brought around. She had felt pressure… pressure to be perfect. She was as confused as can be! She didn't know what she'd be learning, or who the teachers were, or what her grades would be based on! She didn't know who was there, or what it looked like, or if all the other children would accept her… perfect or not! Zoranina crossed the street. There it was: her Neoschool. 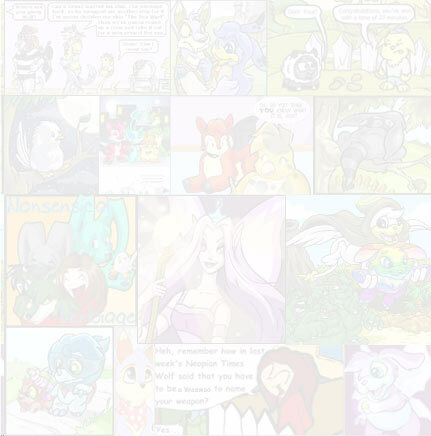 There was a big white banner, reading "ALL NEOPETS NEOSCHOOL: WE ACCEPT ALL!" 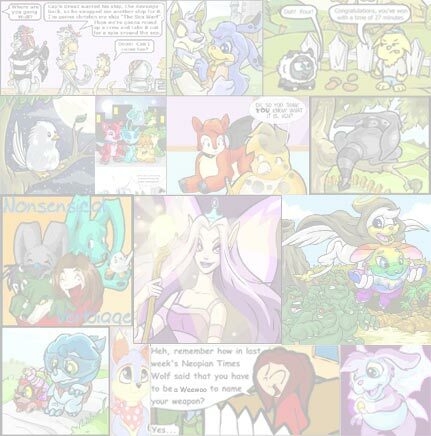 and a big recess yard where all Neopets were playing joyfully. There was a slide, monkey bars, a jungle gym, swings, and a few benches to sit and eat lunch on. But Zoranina could care less about what the recess yard was like. She wasn't the type who liked playing very much. She preferred being as knowledgeable as possible for her age, and she liked to read, paint, draw, and imagine things. Zoranina believed everything was possible. And she liked to go in small corners instead of crowds, and think and learn. The building wasn't all that beautiful. It was white and plain. Zoranina had expected it to be a beautiful blue, or maybe something a little more impressive. But through her owner, she had learned to be grateful for what she had been given. Suddenly, the school bell rang. Zoranina suddenly felt pressure and nerves come to her. She could feel her heart pound very fast. So fast the thumping hurt her stomach. She saw many students lining up in long lines… but Zoranina didn't know which one to go in! She finally decided to ask a tall lady with black curly hair. She was wearing a beautiful blue flowy dress and black strappy sandals. She had pinned a beautiful golden apple broche on the dress. "Excuse me, Miss?" said Zoranina, clearing her throat. "Oh why, hello!" said the lady. "Um… I'm not sure where to go!" said Zoranina nervously. "Well… what's your name? I'll check on the lists of classes to see where you are!" said the lady nicely. "Okay… well, Zoranina," said the lady, putting a check on her list. "It looks like I'm your teacher! This is your line! I'm Miss Applebee. We can talk later! Go in back of the line and follow along!" Zoranina was pleased. The teacher's voice was soft and warm… it almost made you want to hug her! Zoranina walked in line with the others. The inside of the school was actually… quite nice! Rows of gray lockers framed the hallways, and classes lined the dark red walls. Everything was proper and clean, just the way Zoranina enjoyed it! The line entered classroom 415 C. There it was: her future in learning stood right in front of her. For the next year, Zoranina would enter this classroom. She would come here everyday. And it wasn't as bad as she had imagined! Paper garlands were on the walls, and posters on a big billboard read "Be a reader!" and "Learning is good! There was a blue carpet at the end of the room, and on it was a shelf with books. "Now, now! Everyone!" said Miss Applebee, clapping her hands. "As you can see, there are some cubbies in the back of the room! Each of you can find your cubby and put your things in it! After you may come sit down on the blue carpet!" The class rushed to the cubbies. After that, they went to the blue carpet. They all started to whisper to each other. "May I get your attention?" asked Miss Applebee. The room grew silent. "Everyday, for the next year, you will be doing what you just did! That is coming in to this very class, putting your things in the cubbies and joining me here on the blue carpet! We will read a story here, and then move on to some activities! Then you will proceed to some different classes! This class is called 415 C, just like the classroom. You are all students of 415 C, meaning I expect you all to get along well and to be friendly to each other! Before reading, we will each say our names in a circle, and we will say our favorite food!" "Hello," said a boy. "My name is Alejandro, and my favorite food is… baked beans!" "Good job Alehandro," said Miss Applebee. "Now, who is next?" By the time it was her turn to say her name, Zoranina felt nervous. She really didn't have a favorite food! "Um… hello," she started nervously. "My name is Zoranina. My favorite food is… um… omelettes and jelly!" She felt relief and as if the worse was over! By the time everyone had said their names and their favorite food, it was time to read a story. "Well… I have thought about it… and today I have decided, instead of reading a story, we will discuss what we think Neoschool is! That's because today is everyone's first day! It's important I tell you what you will be learning!" said Miss Applebee. Miss Applebee stood up and got a poster from her desk. Then she came back to the blue carpet and sat back down. "Now, this year will be full of fun!" said Miss Applebee joyfully. "We will be learning how to start reading, and painting! And-"
Suddenly, a thin blonde lady with a red dress came in the room. "Oh!" said Miss Applebee. "I guess we're just a tad off schedule! Well, this is your music teacher! Her name is Miss Claudette!" "Hello everybody!" said Miss Claudette. "Now, get back in a line, and we'll head off to the music class! The class made a line behind Miss Claudette, and they hurried down the halls to the music room. The Music Room was a very beautiful and bright room. The walls were painted light blue and bright pink, and there were posters of instruments all over the walls. "Now, class," said Miss Claudette, taking a seat on a small chair. "All you children can take a seat on the floor. Now, as Miss Applebee said, my name is Miss Claudette! I'm your music teacher! Now, can anybody tell me what kind of music they like?" "Yes?" asked Miss Claudette, pointing to Zoranina. "Well, my favorite band is M*YNCI!" said Zoranina. "But my mommy likes to listen to classical music! She says it's beautiful!" "Well, to start, your mother is right!" said Miss Claudette. "Classical music is very beautiful! Now, does anyone know what instruments play in an orchestra?" A pink Usul raised her hand. "Yes?" said Miss Claudette, calling on the Usul. "Well… let's see here… there's the violin, the cello, and… that's all I know!" said the Usul. "Well, does anybody here think that maybe the guitar might be in the orchestra too?" asked Miss Claudette. "That's impossible!" said Alehandro. "Guitars are only for rock music!" "Well, what if I told you that guitars can be in the orchestra, too?" By the end of the music lesson, the class had learned 2 new songs, and that guitars did indeed play in an orchestra. Music was very fun, and Zoranina had had a great time! The class made a line behind Miss Claudette again and went back to 415 C. Miss Applebee was waiting for them there. She had set up a few tables with watercolors and different colored papers on them. "Well, class," said Miss Applebee. "How was Music Class?" "Great!" the class said at the same time. "Well, now it's time for art! Now, there is no special class for art, meaning you will stay here with me, in this class, and choose different stations I have created. There are four different art stations. Each table is one station. The four stations are painting and drawing, collage and crafts, jewelry making, and gardening. The garden is in the recess yard. We will water all the flowers and grass. Now, go to the station you want, and if you want gardening, stand in a line by the front door." Zoranina finally decided she should head over to the jewelry table and try making a piece… after all, she would probably be admired by her mother, and she always liked recognition! And she wanted to be cool, like the other girls. "Anyway, so I was talking to my mommy," said the pink Usul who had raised her hand in Music Class to all the girls at the jewelry making table. "And I talked her into buying me the Mermaid Usuki Doll for Christmas!" "Yeah!" said a blue Cybunny at the table. "My mommy bought me a Usuki Marshmallow Set yesterday! It cost lots of Neopoints!" They all beaded their jewelry. What was all this about Usukis? Didn't the girls have other things to talk about? Like reading, or art, or dreams, or what they wanted to be when they grew up? Zoranina could already tell she wasn't going to fit in with these girls! She wasn't interested in playing with Usuki Dolls and painting her nails! She liked to read and do art! Suddenly, a blue Usul stood up from the jewelry-making table. "Why is it all about Usuki Dolls?" she asked. "I mean… our mothers and fathers spend a fortune to feed us… and all you can think about is Usuki dolls?" The blue Usul walked away. Zoranina suddenly felt like she was not alone, and followed the Usul. They both sat down at the collage and crafts table. "Hi!" said Zoranina. "I'm Zoranina. I agree with you. I really don't like playing with dolls! I prefer reading and writing!" Hey! Me too!" said the blue Usul. "I'm Surfi! Do you want to sit next to me at lunch time?" Lesson to be learned: Zoranina learns plenty from her experience! But the importance of this story is that you do not have to be perfect to make a friend. And it's okay to be different… you might be better off! Author's note: I want to thank all who have encouraged me. In Issue 106, I wrote my first story, and this is my second (if it gets in). I hope those who read Layleeah and the Greedy Balthazar will want to read Perfect or Not as well! I climbed into bed, not wanting to think about the next day and what horrors would await me. What is there more to say, really, after the adventure ends?